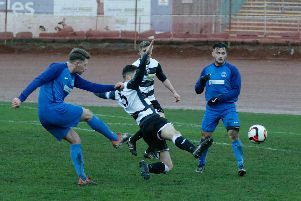 Clydesdale’s last surviving Macron Scottish Junior Cup representatives, Lanark United, crashed out of the tournament on Saturday, writes Tam Anderson. United were defeated 3-1 in a fourth round replay at Rossvale. Rossvale opened the scoring on seven minutes at Bishopbriggs when Matt Niven netted from close range in a crowded area. It took Lanark time to adapt to the artificial surface but in 10 minutes Hugh Kerr came close with a low shot before Declan Lafferty had a good effort which just cleared the bar. Lanark came close on 32 minutes when a well flighted shot from Alan McCrum went narrowly over the bar. Lanark keeper Gareth Hallford produced a good save on 44 minutes when he smothered a header from Stephen McGladrigan on the goal line. And two minutes into the second half Lanark drew level when Ian Watt scored from 10 yards after a good build-up. But the home side restored their lead on 58 minutes when Liam McGonigle broke clear and beat Hallford with a low drive. Ten minutes later, Cammy Lawson brought out a good save from keeper James Donnelly with a well hit free-kick. Rossvale sealed the result and a place in the last 16 when McGladrigan scored with a low shot after cutting in from the right. United had a good spell in attack after this but could not find a finish before Peter O’Donnell was sent off in injury time for a tackle which the over-fussy referee deemed to be serious foul play. United correspondent Craig Martin, reacting to the club’s first defeat in 15 matches, said: “Rossvale are a good team but we certainly matched them. 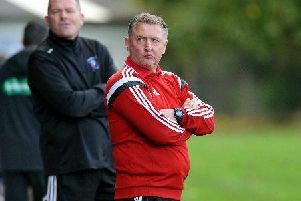 Lanark bid to strengthen their League Two promotion bid at Vale of Clyde this Saturday, KO 1.45pm.